In the world of Major League Baseball, everything is driven by tradition. The “we do it this way because we’ve always done it this way” mantra by which the players play, the managers manage, and especially the umpires umpire may yaw slightly in light of the technological advancements of the times, but overall they are rooted in some sort of archaic wisdom passed down generation to generation. We praise players like Bryce Harper or Mike Trout for “playing the way a baseball player should”. We longingly wax about the good old days when players were manly men and knew how bunt or break up a double play. Many franchises still see the growing sabremetrics community as a neat tool in the box, but don’t harness the true power those numbers can provide. Apparently, cheating in Major League Baseball is just one more tradition that is usually swept under the rug. On April 10th, Michael Pineda was spotted by TV cameras with obvious pine tar on his hand. Even though everyone watching at home knew and Twitter was blowing up over it, Manager John Farrell said he didn’t raise issue because he was unaware until it had already been washed off. That seems … unlikely. The story got some notable national play on the four letter network, but was otherwise soon replaced by nineteen NFL mock drafts and a full statistical breakdown of what Johnny Manziel had for lunch. “Doctoring”, or the act of applying a foreign substance to the ball or otherwise altering it in order to put an unnatural spin on a pitch, is a direct violation of rule 8.02 of the almighty MLB rules bible. No “if”s, “and”s, or “but”s, this player is supposed to be immediately ejected and suspended for 10 games. Now, I am not a major league pitcher (but I was a damn fine catcher in little league), but I’m just gonna throw out a guess that this is what the rosin bag is for. Perhaps it is just another example of not adapting or updating tradition, but pine tar is currently an illegal substance to apply to a baseball. By definition, this is cheating. So, if I am reading this correctly, you would not only understand, but PREFER to have an opposing player cheat? Cheating: just the tradition of baseball. Frank White recently said in an interview on Kansas City sports talk radio that he guessed notorious spit baller “Dr” Gaylord Perry put a foreign substance on the ball “about 85% of the time” during his end-of-career cup of coffee with the Royals. The catcher had a specific sign for “doctored ball” he would put down. Perry himself was never subtle about this fact. He had a whole routine on the mound that lead batters to believe he was doctoring the ball when he wasn’t. He wrote an autobiography in 1974 called Me and the Spitter. He was suspended only once for this. In 1982. After 20 seasons of widely known, accepted, and (frankly) celebrated ball doctoring. In 1994, Albert Belle was accused of having a corked bat. The umpires did their job correctly, confiscating it and trying to hold it for further inspection. Jason Grimsley, who has certainly had more than his fair share of connection to cheating, broke into the umpire’s room “John Bender” style and switched the bat with a clean one. However, he did so with the discretion and technique of a mentally challenged obese panda bear, so the heist was quickly discovered. After FBI involvement and the threat of a burglary charge, Grimsley and the Indians produced the actual bat. It was found to be corked and Belle was suspended for 10 games, which was later reduced to 7. Grimsley was not punished for the incident. Since 2004, 41 major league players have been suspended from MLB for using a banned substance categorized as a Performance Enhancing Drug (PED). This has resulted in over 1800 games worth of suspensions. 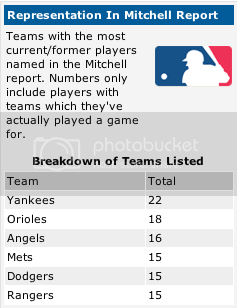 In addition, 54 minor league players with major league experience have been suspended for a total of over 2000 games. Type in “List of MLB Suspensions” into Google and you will be flooded with list after list of players suspended for this type of cheating. What you won’t find are comprehensive lists of players that have been suspended for corking their bat (though I was able to find one on Wikipedia later). Or for doctoring the baseball. Or for any other manner of cheating that has been rationalized as “tradition”. I would love to throw a “only X number of people have been suspended for doctoring vs PEDs” stat in your face right now, but I don’t have the time or desire to dig through the countless “Go get her, Ray!” style PED editorials to try and find reliable source material on other types of suspensions. For some reason, the sports community has a raging hatred for this specific type of cheater. I admit I share this viewpoint. Players using a non-natural substance to gain a competitive advantage over other players? This is unheard of! Grab the pitchforks. Get your torches. It’s time for a good old fashioned cheater hunt! But it’s not unheard of. Players have been cheating via foreign substances since the 1800s. The rule against doctoring the baseball was put in place in 1920, almost 100 years ago. Why is this type of cheating, this style of gaining a competitive advantage, so different than the others? One could go as far as to argue these players were just exercising their form of “the tradition of baseball”. It was the culture of the game at the time and it, like most cheating it appears, was swept under the rug for many years. Before you flood getoveryourself@royalsblue.com with “murder is not the same as speeding” style emails, let me be perfectly clear. I am 100% against the presence of PEDs in baseball. I do think it is a step above other forms of cheating. But, I also think we can all admit that for whatever reason, players suspended for PEDs are demonized at an unfair level compared to those suspended for other offenses. Names like Bonds, Clemens, and Palmeiro incite as much piss and vinegar from people as the most awful criminals of world history. It is duly noted that none of those players would be hated as much as they are if they had just come clean about their PED use initially, but even those honest PEDers (ha!) like Petitte and Giambi will forever be looked down upon as “tarnished”. Joe Niekro? Chris Sabo? Art Fowler? Don Sutton? Wilton Guerrero? I’m guessing you won’t get the same level of reaction to those names. 10 years from now, Pineda will be the same. Just another player we laugh about because he didn’t get the memo that cheating is only to be done on the sly. As such an incendiary and polarizing topic, MLB made plenty of necessary measures to cleanse the game of PEDs. It has helped, but nothing is perfect. There will always be ways around the testing, ways to find technicalities to try to not pay the price (looking at you, Ryan Braun), ways to appeal the system for years while you still have a few years left in the tank. After all, this is baseball. Cheating is tradition.